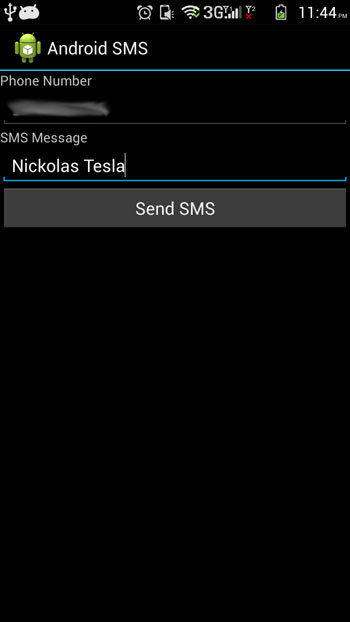 In this Android tutorial, I will walk you through to create an Android app to send SMS. It would be cool to have our own SMS application to send SMS messages. 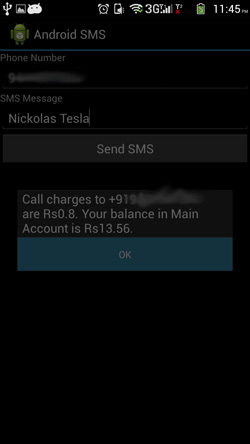 There can be missing features in the SMS application that comes by default with our Android phone. We can use the example application here and build on top of it according to our needs. Application is simple and easy to build. SmsManager class takes care of sending the SMS message. We just need to get an instance of it and send the SMS message. We need to add permission to SEND_SMS in the Android manifest file. Just note the permission added to send sms in the below manifest file. This layout file has the mobile number to send SMS and the SMS message to be sent. Here is the Android Activity class. Its just one thing, instantiate the SmsManager class and send SMS using it. Comments on "Android Send SMS Tutorial"
I find your continuous contribution on the internet of a great value. Since last time I wrote to you, we have closed the college, as we are now concentrating on making software, and we are doing great. Now, how can we do something great for you? I have asked you before, and I would like if you can spend a little time thinking about how we can do something for you? One thing, maybe… Try to click on paper.li, its an automated news paper, where you can link certain twitter accounts, Google+ accounts, facebook etc, and then it generates a news paper based on your chosen feeds. That way, you can indeed create new stuff, in that you make the paper partially get content from sources you respect, and then your own sources. Then that publishes to those who are interested. Its pretty hot, that paper – and free of charge. Thanks David. Sure I will give it a try and see if it helps. Hi, I am making an application where i need to send sms at a particular time of the day. I had set up all the time picker activities and all. But I am confused if I just compare the current system time and the set time, and then use the sendSMS class, would it be sent? Also, does the system needs to be in a certain condition for this to work? Comments are closed for "Android Send SMS Tutorial".